What is Nigel Farage’s favourite novel? Why do Brexiteers love Sherlock Holmes? Is Philip Larkin the best Brexit poet ever? Through the politically relevant side road of English literature, John Sutherland quarries the great literary minds of English history to assemble the ultimate reading list for Brexiteers. What happened to Britain on 24 June 2016 shook the country to its roots. The Brexit vote changed Britain. But despite its referendum victory, Brexit is peculiarly hollow. It is an idea without political apparatus, without sustaining history, without field-tested ideology. Without thinkers. It is like Frankenstein's monster waiting for the lightning bolt. 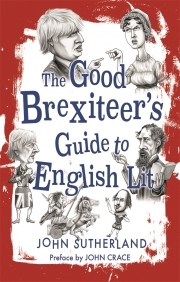 In this irreverent and entertaining new guide, Sutherland suggests some stuffing for the ideological cavity at the heart of the Brexit cause. He looks for nationalistic meaning in the work of William Shakespeare, Jane Austen and Thomas Hardy, in modern classics like The Queen and I and London Fields, and in the national anthem, school songs and great poetry of the country. Sutherland explores what Britain meant, means and will mean, and shows how great literary works have a shaping influence on the world. Witty and insightful, and with a preface by John Crace, this book belongs on the shelves of all good Brexiteers and diehard Remoaners alike. John Sutherland is Emeritus Lord Northcliffe Professor of Modern English Literature at University College London and the author of some thirty books, including A Little History of Literature (2013), How to be Well Read (2014) and Orwell’s Nose: A Pathological Biography (Reaktion, 2017). He is a reviewer and essayist for The Times.